The Massachusetts State Senate passed a Senate Republican order prohibiting the Senate from considering or acting on any bill that would authorize any form of gaming not currently permitted in the Commonwealth, including casinos or slot machines, until 10 calendar days after the filing of the report of the bill by the Senate Ways and Means Committee with the Senate Clerk. To read the text of the order please click “Read more” below. ORDERED, that the senate shall not consider or act upon any bill authorizing any form of gaming not currently permitted in the Commonwealth, including a bill which authorizes one or more casinos, the placement and operation of slot machines, so-called, or any similar activity until 10 calendar days following the filing of the report of said bill by the senate committee on ways and means with the clerk of the senate. I am honored from time to time by the ITT Technical Institute of Wilmington, by being given the opportunity to participate in the school's graduation ceremonies as a speaker. Hearing the stories of commitment and personal dedication that have earned students degrees in such disciplines as information technology, business, criminal justice and nursing is always inspiring, and I appreciate the transformation of the dreams for the future into the ability to realize those dreams through education. Often students graduating from ITT have travelled a non-traditional path, pursuing their studies as the result of a career change or an education career that had been earlier disrupted by a variety of circumstances. Their spirit and perseverance are exemplary. Most recently I was the keynote speaker at ITT's graduation ceremony on July 7th. Following my remarks I was surprised and enthused to receive a commemorative plaque from Campus Director Dr. Nadine Dowling. A photo of the occasion is posted below. Earlier today I was interviewed by Fox 25 News Reporter Sharman Sacchetti regarding a possible increase in the state's gas tax. Please tune in to tonight's news broadcast to view my comments on the subject. On Sunday, July 17th I had the opportunity to meet with ham radio operators from throughout northeastern Massachusetts and beyond at a breakfast with the Cape Ann Amateur Radio Association (CAARA). A particularly important guest at the event was Phil Temples, Section Member from the Amateur Radio Relay League (ARRL), the national organization for amateur radio operators. During the morning's proceedings I presented the members of CAARA (including club President Stan Stone) and Phil with a recently adopted Joint Resolution from the House and Senate, and a Proclamation from Governor Deval Patrick. Each document recognized the importance of the skills, equipment and spirit that amateur radio operators bring to emergencies and community events. You can learn more about amateur radio by visiting CAARA at www.caara.net and the ARRL at www.arrl.org. Photos from the event are posted below and under the "Read more" section, and are courtesy of CAARA member Anthony Marks. With the expected heat wave rapidly approaching and temperatures that could get as high as 100 degrees, it is very important for us all to take preemptive measures to try and stay cool to avoid any health issues. Throughout the Commonwealth cities and towns have designated "cool zones" and have extended communty pool's hours of operations, so please check with your local officials to see where such locations have been designated. • Slow down, avoid strenuous activity. Do not try to do too much on a hot day. • Wear lightweight, loose-fitting, light-colored clothing. Light colors will reflect heat and sunlight and help maintain normal body temperature. Protect your face with a wide-brimmed hat. • Drink plenty of water regularly and often, even if you do not feel thirsty. Attempt to stay hydrated. • Limit intake of alcoholic beverages. They can actually dehydrate your body. • Eat well-balanced, light, regular meals. Avoid high protein foods that increase metabolic heat. • Stay indoors as much as possible. • If you do not have air conditioning, stay on your lowest floor, out of the sun. Electric fans do not cool the air, but they do help evaporate perspiration, which cools your body. • Go to a place where you can get relief from the heat, such as air conditioned schools, libraries, theaters and other community facilities that may offer refuge during the warmest times of the day. • Check with your community for information about possible local ‘cooling centers’. You may also want to call 2-1-1 for ‘cooling center’ information or go to www.mass211.org. • Cover windows that receive morning or afternoon sun with drapes, shades, awnings or louvers. Outdoor awnings or louvers can reduce the heat that enters a home by up to 80%. • Avoid too much sunshine. Sunburn slows the skin’s ability to cool itself. If you are outside, use sunscreen lotion with a high SPF (Sun Protection Factor) rating. Please click "Read more" to read the recently issued press release by MEMA and if you need assstance accessing your local community's resources or a government agency please do not hesitate in contacting your state senator or state representative for assistance. With the extremely hot weather the Commonwealth is experiencing, the Massachusetts Emergency Management Agency (MEMA) is advising people to be cautious and is offering some tips to help keep cool and safe. • Check on family, friends and neighbors. In normal weather, the body’s internal thermostat produces perspiration that evaporates and cools the body. However, in extreme heat and high humidity, evaporation is slowed and the body must work extra hard to maintain normal temperature, which may lead to heat cramps, heat exhaustion and heat stroke. If you believe you, or anyone you are with, is experiencing a heat-related medical emergency, promptly call 911, and if possible, move to a cooler place. The Massachusetts Emergency Management Agency (MEMA) is the state agency responsible for coordinating federal, state, local, voluntary and private resources during emergencies and disasters in the Commonwealth of Massachusetts. MEMA provides leadership to: develop plans for effective response to all hazards, disasters or threats; train emergency personnel to protect the public; provide information to the citizenry; and assist individuals, families, businesses and communities to mitigate against, prepare for, and respond to and recover from emergencies, both natural and man made. For additional information about MEMA and Preparedness, go to www.mass.gov/mema. Follow MEMA updates on Facebook and Twitter. Even as the current heat wave takes its toll, the reconstruction of the Rt.128 bridge over the Annisquam River is continuing at a steady pace and is now approximately 85% complete. I am pleased to provide you with an update detailing current activities and progress on the project. Particularly noteworthy in the Massachusetts Department of Transportation's report is the information of temporary lane closures during off-peak hours to expedite the sand blasting beneath the bridge. 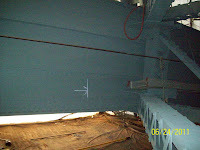 Below are two recent photos taken of the progress of the bridge. To review the MassDOT's most recent report please click “Read more”. Horizontal view of a section of painted structural steel being reviewed as part of a coating inspection. 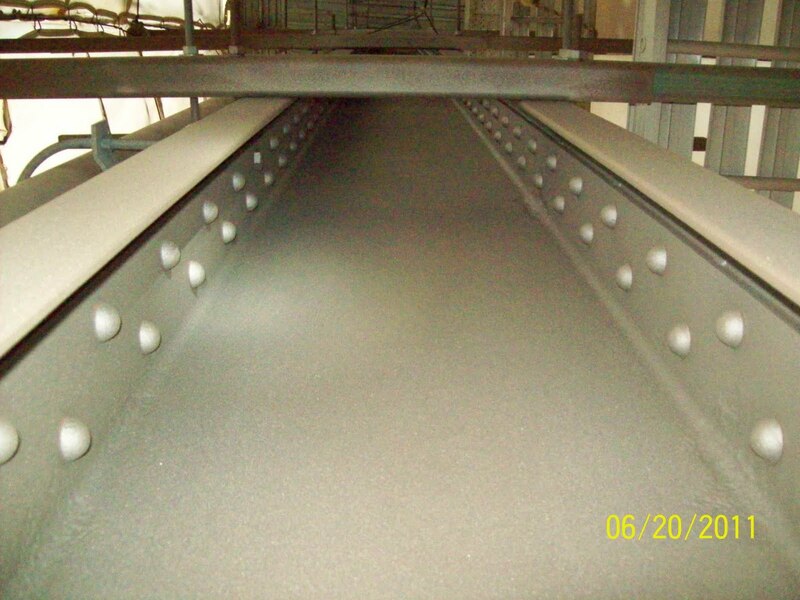 Vertical view of a section of painted structural steel being reviewed as part of a coating inspection. Description The work involves the removal and replacement of the wearing surface of the bridge deck along with rehabilitation of the superstructure and portions of the substructure on Bridge No. G-05-017 carrying Route 128 over the Annisquam River in Gloucester. The project also includes replacement of the sidewalks along with significant structural repairs and painting portions of the superstructure. A new wearing surface will be placed on the bridge along with a new median barrier. The existing bridge railing will be refurbished and a suicide deterrent safety screen will be erected along the sidewalk. SPS New England, Inc. is completing the work. Current Project Status – The majority of the work on the top side of the bridge has been completed. The primary elements of work that remain involve cleaning and painting of structural steel elements along with associated structural steel repairs. All travel lanes are open to traffic in both directions of Route 128; however, there are temporary lane closures put into place during off peak hours to support the sandblasting operations taking place below the bridge deck. The east end of the main span has been cleaned and primed. 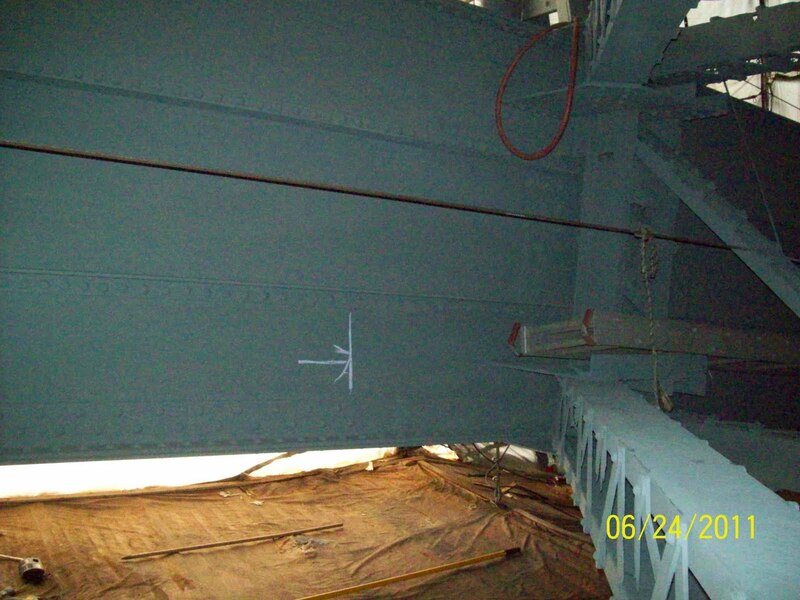 The additional areas of deterioration to the structural steel have been fully exposed. MassDOT continues to work with the design consultant (Gill Engineering) to determine the appropriate course of action to implement repairs. Based on the additional scope of steel repairs and the delays that occurred as a result of the issues surrounding the prior painting subcontractor, the project’s completion date is expected to be extended until sometime in spring/summer 2012. Note: Additional project information and history can be found by visiting MassDOT’s website at: http://www.massdot.state.ma.us and clicking on the Projects tab, then selecting “Current Road and Bridge Projects” and after entering the City of Gloucester, select Project No. 604797. On Wednesday, July 6th members of my staff and I were honored to spend some time with a truly special organization in Wilmington known as "Local Heroes". The organization was founded 6 years ago by Wilmington selectman and Veteran's Agent Lou Cimaglia and meets every Wednesday at the Wilmington Knights of Columbus at 7 p.m. to pack boxes of needed items such as books and magazines, snacks, and toiletries for our service men and women serving in Iraq, Afghanistan, and the Middle East. To date Local Heroes has shipped over 13,000 packages. To learn more about the organization or to either donate time or supplies please click here to visit their website. With your help and continued dedication from people like Lou, Local Heroes will continue to provide comfort to our military men and women who are far from home. This morning I was a guest on Fox 25's Morning News Segment "Tolman and Gray". Former State Senator and political analyst Warren Tolman and I discussed the recent proposal to consolidate 11 of the state's courts and the ongoing conversations between President Obama and Congress about the national debt crisis. To view our lively discussion with news anchor Gene Lavanchy, please play the posted video below. Through his choices and omissions regarding amendments to municipal health care legislation the Governor has indicated an understanding that collective bargaining needs to be changed to enable cities and towns to take action to save money that is desperately needed for priorities such as police and fire protection and education. Unfortunately, he did not show the same understanding for changes to benefit those who are struggling with the costs of prescription drugs, for the need to identify and eliminate the misspending of precious dollars in our state's MassHealth system, to prevent the waste of costly drugs that could be effectively re-used, to assist those burdened by the rates of small group health insurance, and the need to apply the forces of competition to confront the costs of MassHealth managed care organizations. Hopefully the House and Senate will soon consider the vetoes he has issued on these important provisions of the state budget, and override them swiftly and decisively. Yesterday I made a guest appearance on NECN’s “Broadside” with Jim Braude. Among the topics that Jim, political analysis Warren Tolman and I discussed include the 2012 Presidential Campaign, the FY’12 State Budget and the House GOP Ethics Reform rules proposal. Please play the posted video below to watch our lively discussion. Please tune in to “Broadside” tonight at 6:00pm on New England Cable News (NECN), where I’ll be discussing with host Jim Braude and political analysis Warren Tolman the 2012 Presidential Campaign. “Broadside” re-airs at 8:00pm and again at 3:30am. The budget that is being sent to Governor Patrick today includes many important initiatives that will assist our cities and towns in balancing their budgets without jeopardizing essential municipal services. The changes in municipal health insurance represent a major step forward for communities that have been struggling with rising premium costs, while the funding increases in special education and regional school transportation will provide much-needed relief to local school districts. We also seek to hold local aid harmless by requiring that a percentage of the state’s surplus at the end of FY11 revert back to our cities and towns for use in FY12. • comprehensive immigration reform that includes worker documentation certification, increases fines for using a fake ID to secure employment, and gives legal residents priority over unauthorized aliens in securing public housing. These are just a few examples of the missed opportunities the Legislature failed to pursue in the FY12 budget. But the Senate Republican Caucus will continue to raise these and many other important issues in the weeks and months ahead because the state continues to face many daunting fiscal challenges that need to be faced head-on if we hope to spur a lasting economic recovery and sustainable spending practices for the future. To view the budget in its entirety please click here.